Educators have banned the use of Wikipedia as a credible source for students to use. It is deemed that the information gathered on this site is incorrect and insufficient. Although virtually any person can make an edit on any Wiki page, the users of Wikipedia are dedicated to editing false or incorrect information and cite sources to validate the information. Many users are able to come together and compile their knowledge on a subject to share with other users. Wikipedia is an excellent source for analyzing the effects of collective knowledge and how the Wikipedia has blurred the “Expert Paradigm”. Wikipedia is a source for people to pool their knowledge together and revise/edit information on any topic imaginable. 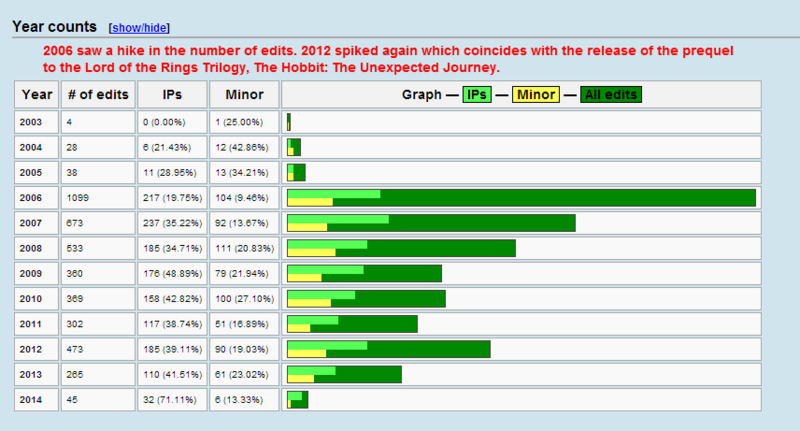 The Lord of the Rings (film series) page is no exception to the wonder of collective intelligence. This page has undergone around 4000 edits over a period of 11 years. This page was created in 2003 by a user that is no longer actively editing Wikipedia pages. There are 31 editors on this page that have edited at least 10 times, with one user having edited 816 times. This semi-retired editor who reached over 816 edits on this page has a history of editing Science Fiction films. The remaining top editors also have affiliations with the Science fiction genre, but are all also currently inactive. This suggests that the users who edit the information are credible since they have a vast knowledge of the genre of science fiction and films. The editors that have contributed to this page have been able to pool their knowledge on the world of Tolkein, Peter Jackson, and the film industry together to create a page dedicated to The Lord of the Rings Trilogy. This page also has 105 sources cited. This topic has maintained a fairly high traffic rate consistent with the popularity of the series with over 160,000 searches a day. The statistics of this page are proof that Wikipedia and its users are dedicated to offering the most accurate and truthful information possible, with editors undoing edits they deem inaccurate. Wikipedia allows users who are passionate or very familiar with a topic share and express their knowledge with others, as seen with a majority of the editors on this Wiki page being fans of film and science fiction. This page proves that although the Expert Paradigm assumes only some people have credentials and knowledge bound by rules of discipline, many people can contribute as much of their knowledge together has a small group of “formally educated” scholars. Wikipedia is not only a source of collective information but a teaching tool in that it “young people coming of age in an information society learn by playing with information”(Jenkins: What Wikipedia Can Teach Us About the New Media Literacies). Wikipedia can teach young people how to properly research information by using Wikipedia. Contributing to Wikipedia and using it has collective intelligence unifies humankinds bond with one another and also unifies the bond between man and technology and humans influence on technology. Henry Jenkins. “What Wikipedia Can Teach Us About the New Media Literacies (Part One).” Confession of an Aca-Fan: The Official Weblog of Henry Jenkins. WordPress. Web. 10 Feb 2014. Henry Jenkins. “What Wikipedia Can Teach Us About the New Media Literacies (Part Two).” Confession of an Aca-Fan: The Official Weblog of Henry Jenkins. WordPress. Web. 10 Feb 2014. 1997 served as a year in which a new domain of information would arise. This domain would eventually become the leading search engine on the web with a reported 5,922,000,000 searches a day in 2013.This search engine has grown and expanded over the past decade, but even with the increase in usage and the Google company’s growth as a search engine, this technology has become part of a daily routine, and as Gunning states, “examining a technology at the point of induction, before it has become part of a nearly invisible everyday life of habit and routine,” which is what I will be doing with Google search. Google has become integrated into our daily lives, with even the Dictionary defining the act of “Googling” or “Googled” as to search the internet for information about (a person, topic, etc.). Google within the sense of Old/New media has maintained a “new” status with constant updates in technological socialization such as the introduction of Google+ and Youtube, and the millions of pages of information available through searches. Google has also carries an “old” status however, in that Google search has become integrated into our daily lives. 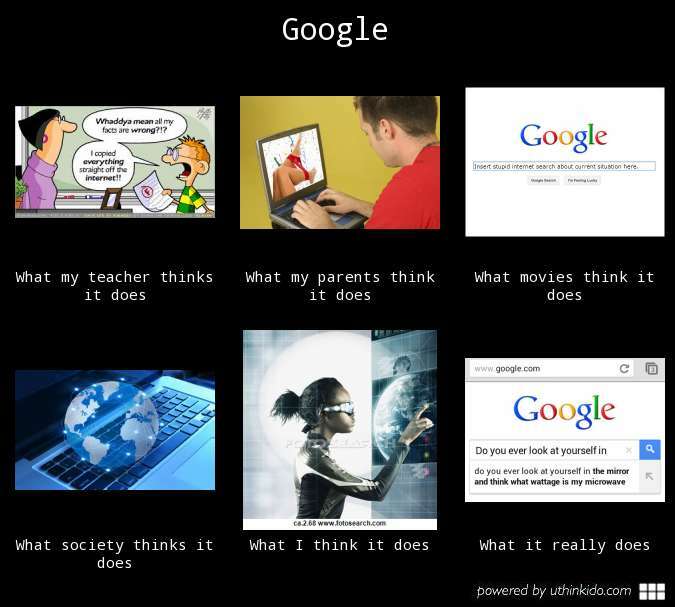 Google’s initial wonder as a search engine that knows everything has become obsolete. As Onion’s cycle for technology goes for Google, “habituation dulls our attention to technology.” I remember the first time I used Google search. I was amazed at the access I had to millions of pictures, videos, and information. I would carefully craft my searches to what I needed whether it was for school or to cure my curiosity. Now however, I do not even have to take a second thought when I Google search something. I just type in my search, click enter, and scan through the top results, occasionally succumbing to the second page of results in desperation. Teachers think of Google as a way for students to cheat on homework. Parents believe Google is a way for their children to find adult content. Google is a way to connect the world and it is an advancement in technology, but it’s daily use has wiped out the first sense of wonder. With millions of documents and information available with the click of a mouse, it is difficult to consider Google has ever being “old” technology, but the reality is, Google can be used to search for any bit of information from scholarly and profound, to mundane and dilauted. “Google Annual Search Statistics”. Statisticbrain.com. StatisticBrain.com, n.d. Web. 30 Jan. 2014. “Re-newing Old Technologies: Astonishment, Second Nature and the Uncanny in Technology from the Previous Turn-of-the-Century”. Media In Transition. web.MIT.edu. Web. Jan. 30 2014.